OraStretch press jaw motion rehab system for trismus, head and neck cancer radiation therapy, and trauma. 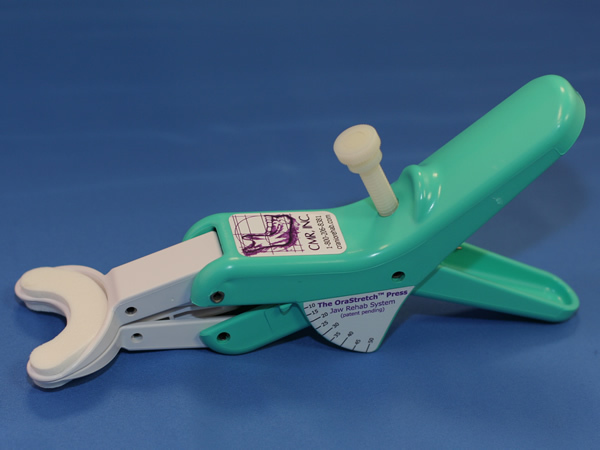 The OraStretch® press is a jaw motion rehab system--a user operated device that opens jaw to stretch the oro-facial tissues and mobilize the temporomandibular joint (TMJ). It is used primarily to prevent and treat trismus and scarring or fibrosis from radiation therapy, surgery, and trauma; and to rehab the joint from TMJ disorder or after surgery. Trismus or jaw hypomobility is the inability to open the mouth. On average, 54% of oral and up to 85% of nasal cancer patients will experience trismus from surgical and radiation cancer treatments. Following radiation, patients will slowly develop radiation fibrosis over the next 12 months, which tightens the tissues and limits the mouth opening. The OraStretch press is used to stretch the mouth open to prevent any loss and to increase the range from the fibrosis. Visit our online radiation trismus presentation to learn more about radiation fibrosis and its treatment. The OraStretch system is also used to treat TMJ disorder, dysfunction, and post-surgical rehab. Patients can use the device to mobilize the mouth and jaw for improved function, to treat pain and swelling, and to prevent scar tissue after surgery. 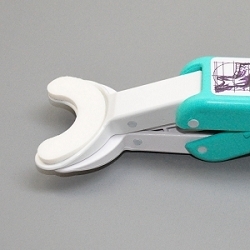 Learn more about the OraStretch press device here. Product information and downloads - product brochures, practice guides, instruction manuals, and recommended protocols. Order pads for the OraStretch press. Learn more and order the OraStretch ROM and MIO Scales for measuring movement and opening of the jaw.